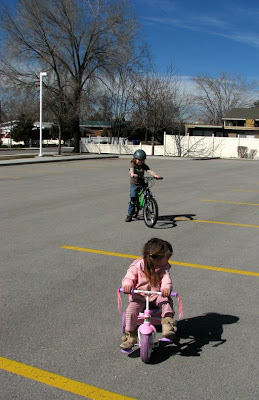 We took the children's bikes over to the church parkinglot for a bit of free-wheelin'. Madd has taken right to riding. She's got the pedaling, the steering, the forward, and the backwards thing down pat. No problem. Trev is a bit frustrated and nervous about riding. He wants training wheels. 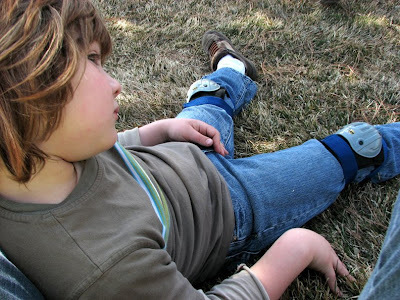 The problem is, his bike has gears, and training wheels cannot (physically) be put on it. Yesterday I just had him motor around for a while. I am hoping that drifting while on his bike (sans pedaling) will help him acquire comfortability with the process. He's not very thrilled about it. Sigh. I just told him that we'll practice everyday for a few minutes. When Sean taught Iain how to ride a bike, he actually took the pedals off and had him get used to the balance thing first. He would guide Iain by the back of the seat then eventually, when Iain was comfortable enough, he would run, holding on to the seat and then let go. Once Iain could coast comfortably, Sean put the pedals back on and Iain caught on like it was a breeze. Don't know if that would work for y'all or not but it might.